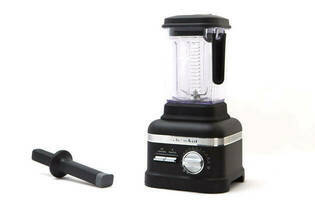 Snapshot: The KitchenAid Proline Blender KSB8270 has 11 speeds and comes with a plastic (BPA-free) jug. How does it rate? Excellent at pureeing frozen fruit, crushing ice, blending kale and grating parmesan cheese. Excellent at making a green smoothie, nut butter and soup. Very good at chopping carrots and making sorbet. Lightweight graded plastic jug (BPA-free) with thermal walls. Easy to remove food around the blade. Lid can be difficult to remove. Liquid may leak around lid cap. Very noisy on high setting.